Mother’s Day Brunch at the Pan Pacific Hotel – Mother’s Day brunch is a special tradition at the Pan Pacific Hotel, and we really go all out! If you want to treat mom to the most lavish brunch in town, make sure you book your table with us by calling +1 (604) 895-2480. Mother’s Day Plant Sale and Tea – Richmond’s historic London Heritage Farm holds an annual plant sale and tea service every Mother’s Day weekend on May 12 & 13. Wander the beautiful gardens, enjoy a cup of tea, and bring home a plant for your mom’s garden! Retreat, Recharge & Reconnect – What better way to treat your mom than by taking her to the spa followed by a night in a luxurious hotel room? 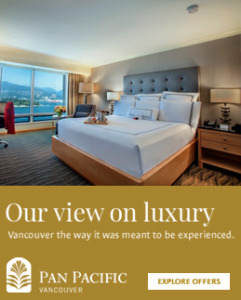 The Pan Pacific Hotel and Spa Utopia have partnered up to offer a package that includes a deluxe guest room and a $300 gift card to the spa. For more information on Spa Utopia, check out last week’s blog post here. Abbotsford Tulip Festival – The Abbotsford Tulip Festival is currently in full bloom, and the fields are truly magnificent. Take mom to see row upon row of vibrantly colored tulips and pack a picnic or treat mom to lunch at one of the convenient on-site food trucks. Ambleside Artisan Farmers Market – This medium-sized market takes place Sundays at Ambleside Park in West Vancouver and features anywhere from 40 to 70 vendors every week. Vendors sell everything from fresh baked goods to jewelry, clothing to honey, crepes, chocolate, spirits… you name it. Take mom for a stroll through the market, treat her to lunch, and let her pick her own Mother’s Day present! Playland – If your mom likes her thrills, Playland recently opened for the 2018 season and is offering free admission and ride access for mothers arriving between 10am and 12pm accompanied by a paying companion this Sunday. Why not do something a little different this Mother’s Day and take mom for a spin on the Tilt-a-Whirl! Wishing you and yours a wonderful Mother’s Day from all of us here at the Pan Pacific Hotel!